Gimenez's fellow central defender Diego Godin added the second goal five minutes later to put Atletico in charge of the Champions League last-16 tie. The Spanish side have kept a clean sheet in all three of their Champions League games against Juve, who need to score at least twice in Turin on 12 March. 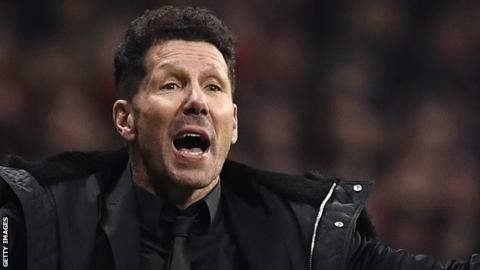 "It wasn't aimed at the other team, I was turning towards our own supporters," Simeone said. "There are many things that can be won in football, but what will always remain are the memories of playing in a competitive team and that is the most healthy and beautiful thing that can happen to an athlete."